MPL has developed an ultra compact Computer Product Family with a case dimensions of only 62x162x118mm, based on the Intel Atom E3800 processor. 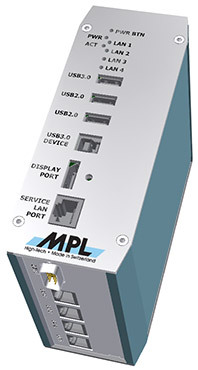 Despite the small footprint, the system still has MPL's typical product characteristics like; robustness, the highest reliability, long-term availability of 10 years, lowest power consumption in the industry, extended temperature (-40°C to 85°C), passive cooling (fanless), and easy expansion. The New Generation CEC is a highly integrated, compact and robust embedded computer system, based on the long-term available Intel® Atom™ Processor E3800 Series with single, dual, and quad core CPUs. It is a small and cost optimized solution for tasks like simple monitoring, up to more demanding communication, controlling, and visualization jobs where reliability is key. MPL typical, the system will operate within a wide supply range of 8-36 Volts without a fan, heat-pipes, or case openings. Besides the low power consumption of 8-18 watts, the CEC offers a configurable power management to provide sleep currents down to 100µA, supporting wake capability (Ignition/RI). Various wake sources (Ignition signal, RS232 Ring indicator, or Wake On LAN), mass storage choices of mSATA, 2,5" HD, or soldered down eMMC opens a wide range of application options. For maximum robustness the CEC is designed to operate in the range of -40°C up to 85°C and withstand reverse polarity voltage, overvoltage, surge and burst voltages, as well as electromagnetic discharges targeting the MIL-STD-461E, IEC60945 and EN50155 standards. To reach a maximum system stability, reliability, and availability (even in 24/7 operation) the CEC is designed for ECC-RAM and only uses ceramic capacitors to maximize the mean time between failure (MTBF) values. The single board solution consists of up to 5 x RJ45 Gigabit Ethernet ports, 3 x USB, 1 x USB Device, Display Port, 1 x RS232 interface, and a mPCIe/mSATA full size slot. An additional RS232 or RS422/RS485 can be added. The main board can also be offered as depopulated version. The RJ45 connectors can be replaced with M12 connectors or SFP cages, to mention just a few of the possibilities with the CEC Family. The new CEC is highly expandable through a board interface which offers 2 x PCIe, 2 x HSIC, 2 x UART, SATA, SDIO, LPC and I2C. This allows a maximum on customization for any I/O Boards, allows to extend the system with additional interfaces. For example: GPIOs, additional serial ports, Gigabit Fiber, CAN , miniPCIe slots even PCI/104-Express port.